The movie that takes the cake for creaming the US Box Office with a production budget under US$50,000. 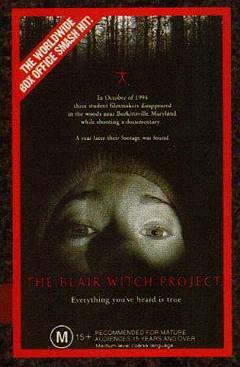 While the film's fearful plot has turned a generation away from camping in tents ever again, Blair Witch¹s biggest shock-waves came in how low-fi publicity could achieve hi-fi payoffs. Three kids go off into the woods, and as their adventures reveal, fear is in the eye of the hand-held camera. The success of this film has been, by some people, ascribed to a clever internet promotion. Certainly a horror film that captured the public imagination, it completely failed with me -- I fell asleep in two attempts to watch it.